Operations in the Falkland Islands date back more than 160 years to 1852 when the Falkland Islands Company ("the Company") was granted its Royal Charter. 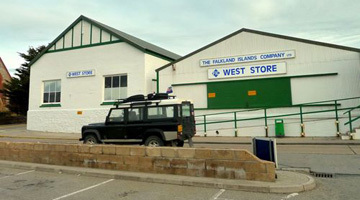 From its early days as a major landowner and sheep farmer, controlling almost half the land area of the Islands, the Company has steadily widened its activities to provide a broad range of essential services to the people of the Falklands. The Islands now have a population of around 3,000, with approximately 42,000 tourists visiting the Islands each year, 35,000 from cruise ships and 7,000 by air. The Company provides a wide range of services to the Islanders and to tourists and corporate partners working in the Islands. The Company's main areas of activity embrace retailing (including food, clothing, electrical goods, home furnishings, gifts and DIY), residential and commercial property, the sale and hire of 4x4 vehicles, travel services including flight bookings, airport transfers and luxury coach and walking tours for tourists, insurance, agency services for cruise ships and fishing vessels, and the provision of freight and shipping services to and from the Islands. The operations relating to the Islands may be divided into five categories: Retailing, Property for commercial and residential use, Motor services including the sale and hire of vehicles, Agency services and Shipping to and from the islands. FIC owns nearly 400 acres of land, with the potential for residential or commercial development. 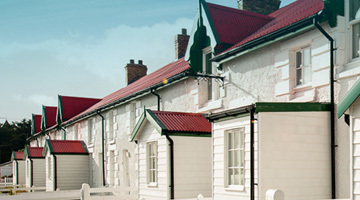 FIC can offer bespoke construction of residential, office and industrial accommodation and has a dedicated team of experienced builders and artisans that involved in the construction of new houses, extensions, and the maintenance of existing properties, such as roofs, window replacement and painting. Apprenticeships are offered to build local capacity and skills. Currently the Company also owns 40 residential properties which are available to rent to individuals or business users such as Oil Services companies, Ministry of Defence contractors, and fishing companies. FIC also offers a "turn-key" housing solution to prospective private homeowners, who wish to buy land and build their own home whereby private individuals can avoid double payment of rent and mortgage payments during the construction period. Shipping Services Falkland Islands Shipping Ltd charters space on the regular Ministry of Defence (MoD) vessels to and from the UK. Retailing forms the largest single element of FIC's trading activities. Locally grown and supplied produce is used wherever possible but most of FIC's products are sourced from the UK and the branded goods sold in the West Store in central Stanley would be familiar to any shopper in the UK (including Waitrose, Tesco, BHS and John Lewis). FIC's retailing operations are the largest on the Islands with a market share estimated at around 60% although there is competition from a number of smaller independent retailers. FIC has six retail outlets in total, ranging from the large West Store supermarket in central Stanley to the Capstan tourist gift shop on the waterfront that serves the 35,000 cruise ship passengers that visit the Islands each year. Other Company outlets sell clothing, office supplies, DIY, home furnishing and building supplies. In total FIC has nearly 30,000 sq ft of retail space in Stanley in addition to the 4,000sq ft general store located at the military base at Mount Pleasant. Currently the Company also owns 22 residential properties which are available to rent to individuals or business users such as Oil Services companies, Ministry of Defence contractors, and fishing companies. FIC is currently planning the development and expansion of its portfolio to satisfy the increased demand expected from the development of oil exploration and production in the Islands. In 2012 the Company formed a Joint Venture with UK construction specialist Trant Construction to focus on larger infrastructure projects for corporate and government clients. The new JV trading as South Atlantic Construction Company ("SAtCO") provides an unrivalled blend of local experience and specialist technical and engineering expertise. With only a basic road infrastructure outside the main urban area of Stanley, four wheel drive ("4WD") vehicles are an essential part of Island life. FIC is the sole authorised importer for the full range of Land Rover products for the Falkland Islands, and is the authorised dealer for JCBs in the Islands. The Company also provides a full spares and repair and maintenance facility at its recently refurbished Garage facilities in the centre of Stanley. FIC offers a range of 4WD vehicles for long and short term hire. Currently there are 25 vehicles available-for-hire, including Landrovers, Discoveries, and Ford Everests. Fully comprehensive insurance is offered on hire vehicles together with a delivery service. 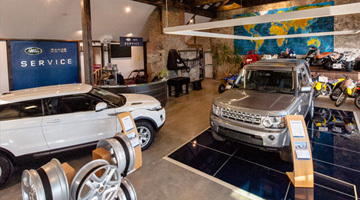 The new show room also stocks supplies of quad bikes, canoes and motorbikes for sale. FIC also has construction equipment, such as excavators, for its own use or available-for-hire to third parties. FIC provides year round cover, 24 hours a day to the cruise ships, tourists and the offshore fishing fleets that can be away from their home ports for several months at a time. A broad range of services is offered, including, logistic, administrative, accommodation, supply and maintenance services. supply of provisions to cruise or fishing boats. The number of cruise ships visiting the islands has risen significantly since the 1990s, with passenger numbers increasing from 7,000 in 1997 to over 35,000 in 2011/12. FIC also has the capacity to provide maintenance and repair services and the provision of agency services for the support vessels and combat ships of the Royal Navy. The Agency also provides services to support seismic survey vessels, including those chartered by FOGL. FIC is also a significant insurance broker in the Falkland Islands and now acts as the sole agent for the Caribbean Alliance Insurance Company providing a comprehensive range of insurance services, including motor, buildings, public liability and contract risk for buildings under construction. Active management by CAIC has led to significant growth in the insurance business. FIC charters space on the Ministry of Defence (MoD) vessels that support the military garrison on the Islands. The military operate ten sailings to the South Atlantic per year and FIC uses this regular service to transport its goods from the UK to the Islands. Falkland Islands Shipping will provide advice and guidance on all aspects of the shipment process and its staff have unrivalled experience in the cost effective shipment and tracking of all types of cargo to and from the Falkland Islands. Falkland Islands Shipping can arrange storage if required, assistance with customs clearance and then delivery to a local destination of choice in the Islands.